I don’t know about you but I am really enjoying the process of working through the Liturgical year. In my mind, this was going to be a radical practice requiring lots of time and effort. But I have found it to be a relatively easy thing to do, yet it is something constantly calling me to pay attention to what God is doing. By the simple act of daily reading a few Scriptures and focusing my attention on one Story, everything in my life gains a direction. It is a margin taking all of the chaotic moments of life and refocusing them with purpose. It clarifies what God is saying and the direction he is pointing me in. It saturates my world with God. This is what it was meant to do. And this week’s stop on the journey calls us to this. Epiphany is a time when we celebrate the Incarnation. God becomes a human. He lives a human life to give meaning and purpose to ours. And does this by living fully in the Spirit. He is a human that lives fully immersed in God. At the beginning of Jesus ministry, he has this moment where he is literally immersed and confirmed as the Beloved Son. Heaven rips open and makes its entrance on earth. So when we participate in this ritual, it is not just a thing we do so we can “get it right.” It is participating in the life of Jesus. It is a reminder of how we are to live immersed in the Spirit and that heaven is wanting to make its appearance right here and right now. The word “baptize” really means immerse. I think this is a double entendre. This is more than just a ritual, it is a way of life. He is telling us to go and teach people how to immerse themselves in the life of God in each and every moment. Jesus comes to show us how to live a God-saturated life where we are constantly filled with and living in His Spirit. Now if you are like me, this can sound a little cliché. We may know this on paper, but the nuts and bolts of it often escape us. But this story points us to what it means. 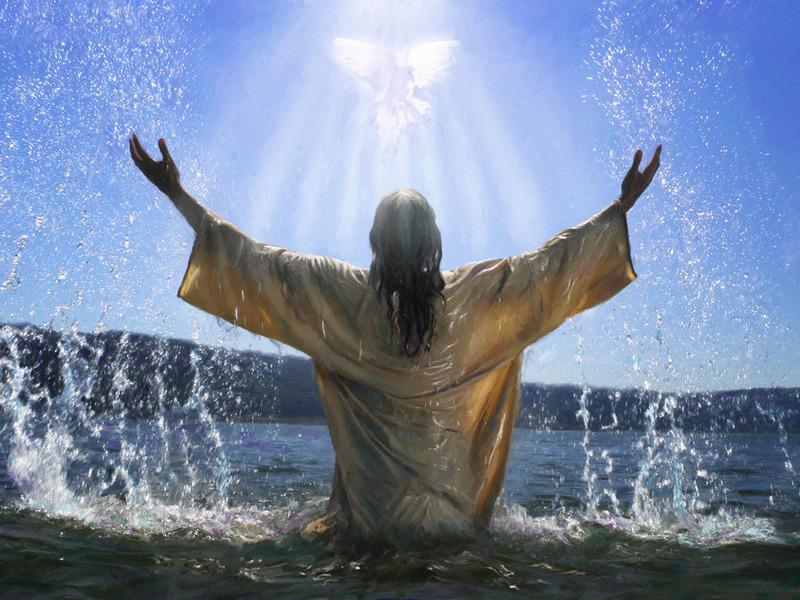 The moment Jesus is immersed in the life of God and receives the Spirit, it comes with a message: You are my beloved son, with whom I am well pleased. Before the miracles, the teaching, the followers, the crucifixion or the resurrection, Jesus is immersed into who he really is. This is how we begin life in the Spirit. On my drives to work, I am listening to Greg Boyd’s Present Perfect. He gave a practice that has really helped me root myself in this. Because of gravity, everywhere you go you are in contact with something. Gravity is a lot like the love of God. It is constant, we just often are not paying attention to its effect on our lives. So this week, use the contact of your physical body as a reminder you are loved. Especially when you are feeling lonely, frustrated or discouraged, stop and notice you are in contact with something. Allow that feeling to remind you God is holding you and you are his beloved child. This entry was posted in Epiphany and tagged Baptism, Beloved, Epiphany, Greg Boyd, Identity, Immersed, Jesus, Life, Practices. Bookmark the permalink.